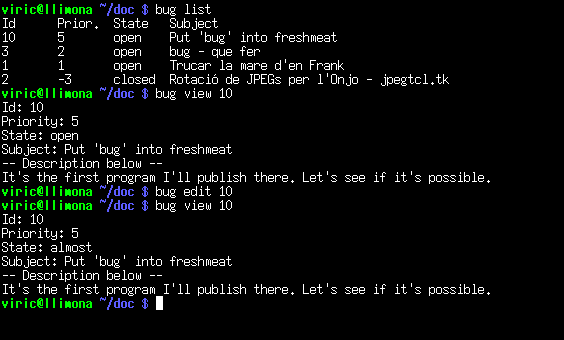 Bug is a simple todo-tracking system for the unix commandline. It's written in POSIX sh, and it only requires the typical Unix utilities: grep, cut, tr, ... It should probably work with a small busybox. The lack of dependencies was the biggest motivation for its development. Its database format is a text file containing simple tabbed columns which can be even hand-edited. It uses $EDITOR for submitting or editing the issues and for changing states or priorities. It relies on four fixed fields: ID, Priority, State, and Subject. There is also a fifth free-text field for any other information you may want to store about the issue. There is no database locking or notifications, so it's mostly for tracking the user's own issues. You can look at a screenshot if you want. Look at the version repository if you are interested in its development. #     be using. Use an absolute path. It may be, for instance, "~/todo.bug"
#     Use integers for the priorities. Higher -> more priority. #     multilines only below that label. #     When I consider an issue is fulfilled, I negate its priority. #     Do that whenever you will not need the issue anymore.